Ten soldiers who died in World War One and whose bodies were found in France five years ago have been named after DNA analysis of samples from relatives. Since the discovery of the bodies in 2009 the Ministry of Defence (MoD) has been tracking down potential relatives in the hope of identifying them. The remains were spotted during construction work near the French village of Beaucamps-Ligny. They were found alongside five other bodies which are yet to be named. All the soldiers were with 2nd Battalion The York and Lancaster Regiment, and are believed to have died in battle on 18 October 1914. The men are due to be given a funeral with full military honours in October, while investigations continue to try and track down relatives for the remaining bodies. Retired computer programmer Peter Hague, 70, of Chinley, Derbyshire said he was "astonished" to find that his cousin twice-removed Cpl Francis Carr Dyson was among those identified. "It is always strange, and poignant moment when you discover you are related to someone like this, I suppose the sadness of his death is mitigated when you know they died during service for their country," he said. Mr Hague, who is widowed with two children, said some years ago he had researched his own family background and was aware of the existence of Cpl Dyson. And after posting details on a genealogy website, Mr Hague said he was contacted "out of the blue" by a genealogist working on behalf of the MoD. "I gave a DNA mouth swab about six months ago, and it has led to this, it's amazing really," he said. Defence minister Lord Astor of Hever said: "Our thoughts remain with all those who have made the ultimate sacrifice in the service of our country. "Although these soldiers fell almost a century ago, the Ministry of Defence still takes its responsibility extremely seriously to identify any remains found, trace and inform surviving relatives and to provide a fitting and dignified funeral so they rest in peace." The funeral of the men has been organised by the 4th Battalion The Yorkshire Regiment, which traces its history back to The York and Lancaster Regiment. A DNA sample from retired BT manager Barrie Richmond was able to identify his great-uncle Pte Richmond. Mr Richmond of Ravenshead, Nottinghamshire said: "We are surprised and amazed and excited - and humbled. He was a great-uncle we didn't know anything about - perhaps it was the grief, that people didn't want to speak about it. "We have found out so much about him. He enlisted in October 1904, signed on for three years, served in India, then worked in the lace making industry before being recalled in 1914. "He was from Radford, Nottinghamshire, and married wife Ellen, but they had no children." For 69-year-old retired teacher, Marlene Jackson of Garstang, Lancashire, she discovered she had a great-uncle, when her DNA matched that of Pte Allcock. She said: "It was quite a surprise when they initially phoned, I had no idea I had a great-uncle, it was never talked about in the family. "They said would I mind giving my DNA, and I did and now it's confirmed. "He was the brother of my grandmother Ethel, who died aged 102 in 1988. He had enlisted as a soldier and served in India and Ireland before the war, leaving his wife, also Ethel, and two daughters when he died. 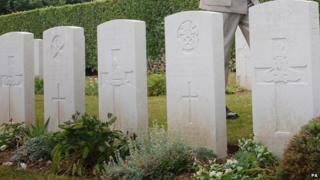 "I feel quite emotional about this, I never knew I had a great-uncle who had died in France. We're going to the re-burial in October." And for Maureen Simpson, 75, from Stradbroke, Sheffield, who is the grand-daughter of Pte Brameld, the process had allowed her to "close the book" on the mystery of her relative's final resting place. "It will be lovely to see them properly buried. It is what they deserve," she said.